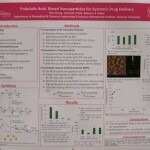 Bader is exploring new methods of drug delivery for Rheumatoid Arthritis treatments like methotrexate. 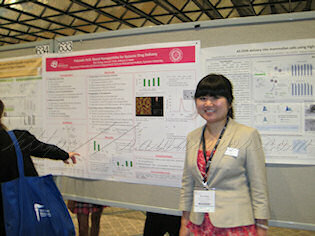 Her lab is using natural biodegradable polysaccharides to make nanoparticle drug carriers. They can target tissue affected by RA because the pore size is much larger (10 to 1,000 nanometers) than healthy tissue which may only be five nanometers wide. I can’t help saying it: A spoonful of sugar helps the medicine go down. It’s surprising how often people I meet have their own e-patient story to tell. Time after time, the principles of empowering patients come alive as people tell me their stories. Becky remembers a time when she dragged her left leg behind her. She went to doctors and they told her it was just a bruise. That might make sense if it hadn’t lasted five years? “Five awful, long, painful years,” she remembers. Today, Becky ran in her first Boston Marathon. 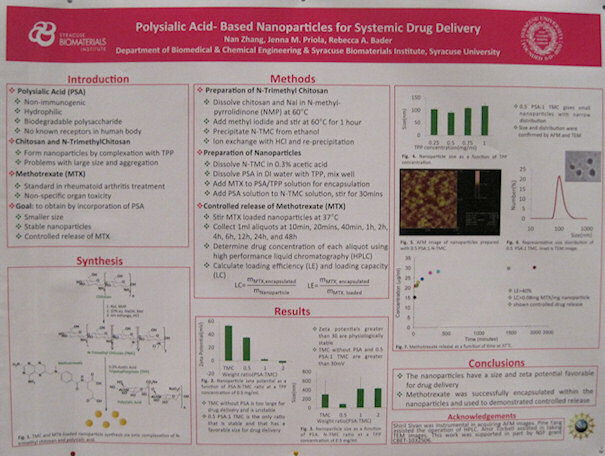 Click to enlarge and view Nanoparticle Drug Delivery poster! 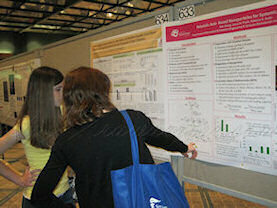 Read more about Professor Rebecca Bader’s Lab at Syracuse University. Discount: $5 off No Minimum! Disclaimer: Please enter coupon code before completing checkout. Discount is applied to the base price subtotal and does not include shipping, taxes, or additional charges. May not be combined with other offers. Coupons valid from 4/21/2011 to 4/25/2011 11:59 pm MDT. What a wonderful story of empowerment! Thanks for sharing! Kelly – 2 great stories!!! First about the continued research for RA meds. I love hearing that – I’m finding myself so exhausted lately. 10 years on Methotrexate and biologics is wearing away at me. Terrific second story about Becky’s hip injury, subsequent surgery and recovery!!! Proof positive that you need to not take NO for an answer and continually seek answers. I hope you get some of your answers for your RA which seems to be of a more stubborn form than mine. Keep up the good work!!! I love all you do. Thank you Professor Becky for trying to improve the lives of those with RA! I know I sure could use some improvement. I have a grand daughter now, I’m 49 with RA and permanent damage to my joints, especially my left knee and shoulder. This happened before diagnosis. Your story of dragging around for a five years, rang a bell. I limped for 3 yrs until I was diagnosed and treated. I have never liked running, mainly because I have scoliosis, but yet I mourned the fact that I cannot run any longer. I have joked before (kinda), what if a bear was after me? I would be his lunch for sure. I do wish I could run. Then I remember those that can’t walk, like my brother, who is a new paraplegic, so I can’t really complain too much. 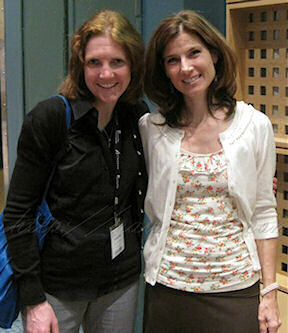 Kelly, I am glad you get to meet so many cool people and introduce us to them. I am also glad for the great work you do for all of us with RA. I am also glad that I can be glad like you and Pollyanna 😉 Bless you and Professor Becky. This is awesome news. Thanks Professor Bader for your research efforts to help find a cure for RA. You are wonderful. Thanks Kelly for all you do as to bring awareness to this awful disease. How you are to meet all of these people. Thanks for sharing her story with us. You are both and inspiration.